Washington, D.C. is the capital of the United States of America. It's the seat of all three branches of the government and it offers travelers an impressive collection of public museums, monuments, and memorials. The city is very diverse and vibrant, and visitors will not be disappointed. Backpackers, students, interns, and young travelers all flock to the city for it's many opportunities. Hostels offer a fun and unique place to stay that is affordable and social. If you want to meet other travelers, then a hostel may be your best option. How much do hostels in Washington cost? A good hostel for solo travellers, female travellers, backpackers, and small groups. Highroad hostel is conveniently located in Adams Morgan near the U Street Corridor and the Dupont Circle area. It is surrounded by one of the best nightlife areas in the city and you'll find no shortage of interesting bars and restaurants nearby. There are many independent and local shops and there are clubs if you want a place to hang out late into the night. This hostel is a fun place to stay with plenty of common areas where you can meet other guests. There's a large kitchen with upgraded appliances. There's also a unique parlour room that has a great fireplace where you can hang out. There are also public computers you can use and a wonderful staff that can help you with recommendations and travel suggestions. This hostel has a wide range of dorms to choose from. There are four, six, eight, and fourteen bed dorms so regardless of your budget and travel style, there should be an option that works for you. There are also female only, male only, and co-ed rooms available. Every bed has a foam mattress, a reading light, a security locker, and bed dividers. A good hostel for backpackers, solo travellers, female travellers, and small or large groups. HI Washington DC is one of the most popular hostels for budget travelers and backpackers in the city. It's close to most of the city's top attractions and is a friendly and welcoming place at a very reasonable price. The hostel attracts both domestic and international travelers and has a fun and diverse crowd on any given day. The hostel is located in the heart of downtown DC. It's about eight blocks from the White House, eight blocks from the National Mall, and four blocks from Chinatown. It's also just three blocks from a metro station and very close to many bus stops. The surrounding area has many different bars, restaurants, and entertainment venues. The hostel has a wide variety of amenities available to guests include a complimentary breakfast every morning, free city tours, movie nights, a pool table, game area, and a large common room. There is also wi-fi available throughout the hostel. The hostel has both dorms and private rooms available. Dorms sleep four, eight, or ten people and private rooms have two twin beds. If you stay in a private room you can choose from shared or en-suite bathrooms. Dorms have female only, male only, and co-ed rooms to choose from. Washington DC House is another great option in the city. It's located downtown near many great shops, restaurants, and bars, and is close to two different metro stations, three bus routes, and a bike share program. This is a trendy and fun place to stay that has a free happy hour every day. The hostel also has all kinds of things that guests can do. There are video games, board games, books, and more. There's also a fully stocked kitchen where you can prepare your own meals. If you want a truly unique backpacker's experience, then this is a great hostel. The staff are fun and helpful as well, and it's easy to meet other guests while you're here. There are four, six, eight, and twelve bed dorms available, all of which are co-ed. A good hostel for students, interns, and backpackers. 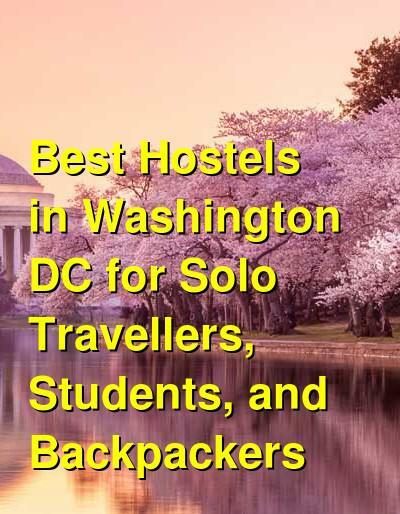 Duo Housing DC is another one of the most popular hostels in Washington DC. It's a top place to stay whether you're a backpacker, student, or intern. It's conveniently located near public transportation and is just fifteen minutes from the Capital Building. It's also just five minutes from Chinatown and is very close to many different restaurants, cafes, shops, and nightlife. The hostel is a great place to meet new friends. There are common areas where you can hang out and there's a quiet study area if you want to get work done. The staff are available 24 hours a day to help you with any questions you might have. There are dorms that range in size and include four, eight, ten, and twelve bed rooms. All of the rooms are co-ed.